The recent question of "Can videogames be funny?" comes with a grim assumption: They never have been. That was certainly true in the beginning. Early digital games were created with the same objectives as their analog equivalents: to challenge, to entertain, to measure skill and stir competition between players. Did they really need to be funny on top of that? After all, you don't hear sportscasters on ESPN puzzling over how to make basketball hilarious, nor did Bobby Fischer disappear from the world of chess because he wasn't allowed to make his knight corpse-hump a fallen rook. Early videogames were built to be played; humor was a luxury that designers could rarely afford. As the years went by, technological limitations faded and production budgets swelled, freeing developers to tackle the grander questions of "Are videogames art?" and the less-asked but still important "What is it about 'your mom' jokes that doesn't translate to C++?" But despite these newly available resources, most games were still largely humorless affairs. The rare exceptions like Monkey Island only served to whet our appetites for comedy rather than sate them. 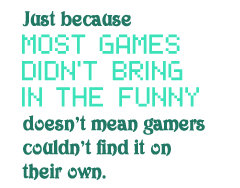 But just because most games didn't bring in the funny doesn't mean gamers couldn't find it on their own. That famous line, delivered by the sinister yet devilishly handsome CATS in the 1989 Japanese shmup Zero Wing, has become a part of the gamer lexicon. It was such an internet phenomenon that CATS' fame echoed all the way to TIME Magazine. But despite its fame, Zero Wing is only a small part of a greater legacy. Gaming is doubly indebted to Japan: first, for reinvigorating the medium with the Nintendo Entertainment System after the nigh-apocalyptic crash of 1984. And second, for enriching their wares with translations so garbled the games can't help but be funny. Who knew the humble beginnings of Metal Gear's surreal storyline would include a guard shouting "I FEEL ASLEEP!!" upon waking up and gunning down the rookie Solid Snake? Or that Nintendo's penchant for censorship would have an enraged elder mage screaming "You spoony bard!" at an assumed abettor of his daughter's demise? It may have not exactly fit the scene's desired dramatic tension, but the line's infamy has endured through fresh translations and even snuck into other games. Better still were the botched translations that marred a game's ending through poor grammar and typos. Ghostbusters for the NES is a prime example, particularly because the most recent Ghostbusters game has furthered the dialogue on humor in games. While the writers and actors of the new Ghostbusters wrestled with the quandary of adapting proven filmmaking skills to consoles, the NES title simply boasted "You have completed a great game" to those with enough affection for the films to wallow through a phoned-in shell of an experience. It was part of the Japanese programmer's message of "conglaturation," which promised that your efforts "prooved the justice of our culture." Maybe it was worth the slog after all.